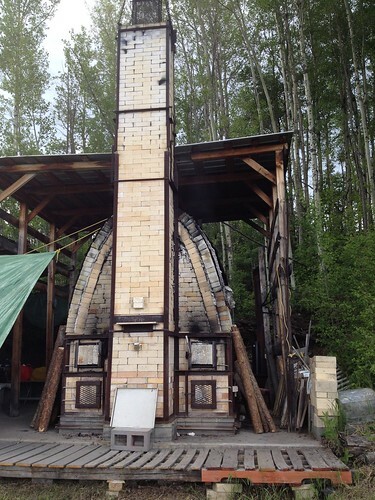 Twice a year, the pottery studio I work out of rents this wood fire kiln. It’s an incredible opportunity for amateur potters like me to learn about wood firing. 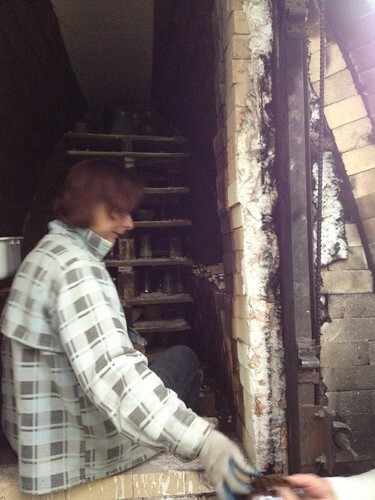 These photos are from the June firing. This month, while I am travelling, my newest pieces will be fired without me. During the rest of the year, I fire my pieces in the studio’s electric kiln. 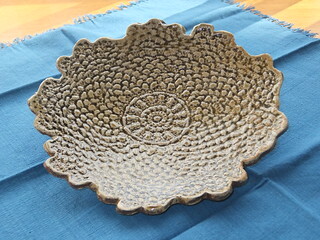 Glazes are a combination of chemicals that when heated during firing turn to glass, the colour of which depends on the recipe of the glaze used. The heat in an electric kiln is always constant, so the colours of the glazes turn out consistent and predictable. If applied correctly, robin’s egg blue is always blue, and autumn leaves is always a deep red-brown. Firing in a wood kiln adds an element of unpredictability to the process, and with this unpredictability comes opportunity. Instead of rising steadily, the temperature fluctuates as the fire is stoked by hand until it reaches 1200 degrees Celsius. Ash blows around and settles on the pots, producing unique effects that can never be reproduced. 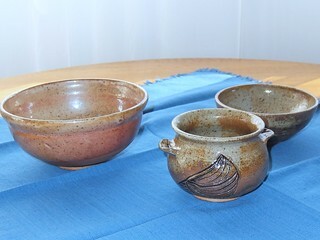 Even the weather during the days the kiln is fired can affect the results. 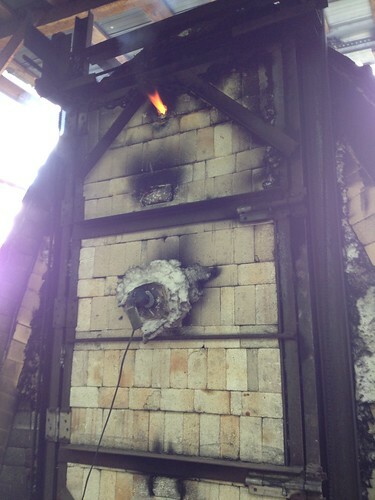 Once 1200 degrees is reached, the “cones” are checked to see if the kiln is hot enough. The cones are small upright indicators that bend in succession as the kiln heats up. 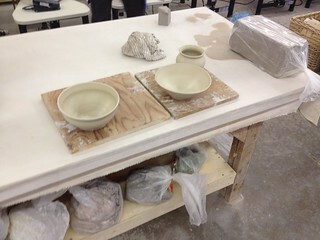 Then the vents are closed so that reduction can occur, a step that is important for some of the glazes. 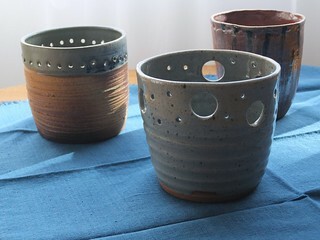 Finally, you can see some of my pots from that firing by clicking here. It’s been more than ten years since I took my first pottery class and made my first crooked and heavy pots. 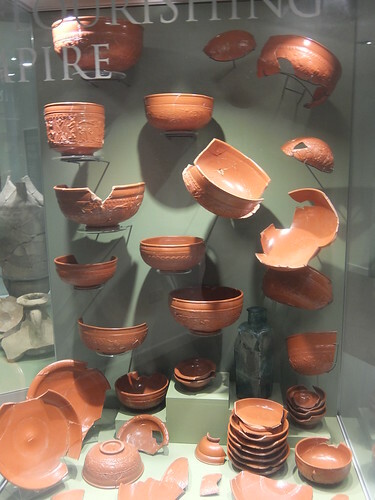 During that time, I have thought a lot about how the process of creating pottery and the writing process are similar, and I have written about those similarities. There is nothing like a wood-firing in the writing process, though: there is no moment when the writing is so out of the writer’s control that it can come out in completely different than expected. At least, not in my experience. For the writers out there, do you have any thoughts about how writing can be (or is) “wood-fired”? 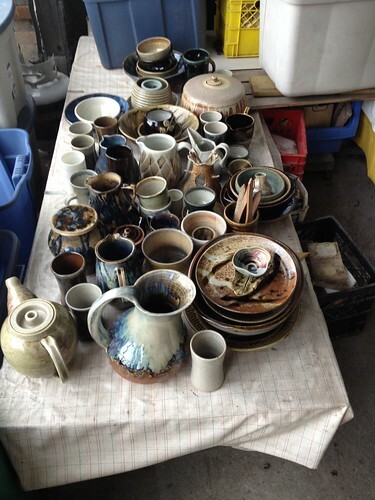 In April, I went back to the pottery studio after more than a year away. Before, when I was working, going to the studio was about doing something with my hands. About the pleasure of taking my frustrations out on an unsuspecting lump of clay and feeling a bit better at the end of the evening. I was happy to make the same bowl over and over and to glaze those bowls with a few favourite glaze combinations. I learnt a lot about technique making those bowls, discovering exactly how thin the sides could be and how little clay I could leave at the bottom before a piece collapsed in on itself. I was always late for my Thursday evening class – but I made it, and that was an accomplishment by itself. At some point, during the busiest part of managing the library expansion project, I decided I didn’t have time for pottery any more. Now, I have more time and I’m on time: I get the full three hours of studio time. I find myself thinking about new techniques and designs to try next all week. 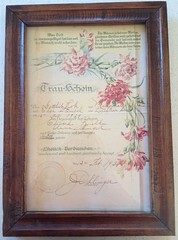 I discovered Pinterest and am busy pinning pieces that inspire me. I’m not throwing many bowls these days – instead I’m trying to create my version of this creamer with a matching sugar bowl and playing with vases with cutout designs. For the first time, pottery is about more than just technique. Suddenly, I am a beginner all over again. Note: this post is part of a series about my adventures during a year long, self-funded sabbatical. For more, click here.